Remarks and Reflections by Kirby Congdon. Presa Press, 2014. Coming from an experienced poet, Kirby Congdon’s Remarks and Reflections centers its focus on all things poetry: the definition of poetry, who writes it, who reads it, the connection between laptops and the process of writing, the idea of prisoners writing poetry, the idea of voice in poetry. 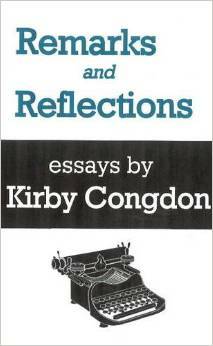 As the title suggests, Kirby Congdon’s essay collection essentially tracks some of his personal musings. He carefully articulates his opinions, not shying away from throwing out the obvious viewpoint and instead voicing his personal view. This results in this collection feeling like a very beautifully written, personal journal. One of his tasks involves trying to define poetry and identify poets. Honestly, these topics appear to be quite simple: poetry as a variation from prose and some type of verbal art form; poets as on who writes poetry. Most people know what poetry is: Roses are red; violets are blue… However, defining the art takes on a new challenge since poetry takes on so many forms; poetry is not simply sonnets but can also take the form (or lack of a fixed form) of free verse poetry and of prose poetry. These questions could remain a challenge yet fairly simple if Congdon focused solely on mechanics; however, he delves deeper, taking time to really analyze them and the actual purpose behind them. In “Defining Poetry,” Congdon admits that perhaps the closest definition of poetry is “the verbal art;” however, rather than focusing on the mechanical definition of poetry, Congdon explores the emotional and creative connections between a poet and his/her work. He asserts that writing poetry takes private, subjective concerns and transforms them into public, objective concerns. He beautifully articulates, “The poem, the painting, the new bridge across the chasm are now public property for the traffic of strangers who are looking how to get across the abyss.” The poet’s job is to help guide the reader through difficult subjects while still remaining true to his/her creative process. In addition to its appearance in the first essay, the theme of using poetry to explore complex issues and emotions appears throughout the collection. In “Why Write Poetry?,” Congdon explains that poetry is ideal when “our feelings and visions are too complex to be expressed in a plain English sentence because they overlap and meaning, like thought itself, doesn’t come to us in grammatical form.” If prose cannot aptly represent the inner-workings of the mind since conventions limit it, poetry can possibly bridge the gap. Also, the essay entitled “Some Reflections” chides some modern poets for being too pressured to produce many poems to be published for recognition instead of focusing on developing a few poems and “exploring one’s own psyche.” These poets focus on fame to an extent that disallows them to focus on the complexities, which poetry should address. One of the most interesting essays in this collection is “On Collecting Books.” In this essay, Congdon takes what appears to be a very mundane practice and explores its significance, adding complexities to this seemingly basic act. Do we merely accumulate books for an academic purpose or for convenience? Congdon sees a personal collection as a “testament to the owner’s intellectual worth.” He also describes a personal collection as an “autobiography” since it is able to reveal information of one’s personal tastes. The book shelves are also “creating a biography” and also “becoming a library.” He also implies that a collection of this type can symbolize one’s self-expression and self-fulfillment and even function as a means to preserve one’s culture. A simple act of owning books because an opulent gesture. In this essay compilation, Kirby Congdon muses over various subjects related to writing and reading poetry. He often wrestles with lofty subjects and coolly analyzes them, adopting at times an unexpected but logical viewpoint. His overall charismatic and poetic writing style coupled with intriguing viewpoints make this essay collection an engaging read. Cayla Weltzin is majoring in English and minoring in Spanish. She is the current Fiction Editor at Portage Magazine. In the future, she aspires become a published novelist.